Adrian Frutiger died on September 10, 2015 at the age of 87. He was one of the most important type designers of his generation, having created some 40 fonts, many of them still widely used today. 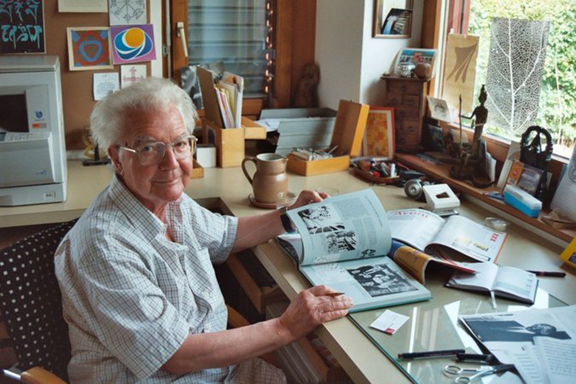 He was also a teacher, author and specialist in the language of graphic expression and—since his career spanned metal, photomechanical and electronic type technologies—Frutiger became an important figure in the transition from the analog to the digital eras of print communications. Frutiger was born on May 24, 1928 in the town of Interseen, near Interlaken and about 60 kilometers southeast of the city of Bern, Switzerland. His father was a weaver. As a youth, Adrian showed an interest in handwriting and lettering. He was encouraged by his family and secondary school teachers to pursue an apprenticeship rather than a fine arts career. At age 16, Adrian obtained a four-year apprenticeship as a metal type compositor with the printer Otto Schlaeffli in Interlaken. He also took classes in drawing and woodcuts at a business school in the vicinity of Bern. In 1949, Frutiger transferred to the School of Applied Arts in Zürich, where he concentrated on calligraphy. In 1951, he created a brochure for his dissertation entitled, “The Development of the Latin Alphabet” that was illustrated with his own woodcuts. It was during his years in Zürich that Adrian worked on sketches for what would later become the typeface Univers, one of the most important contributions to post-war type design. In 1952, following his graduation, Frutiger moved to Paris and joined the foundry Deberny & Peignot as a type designer. 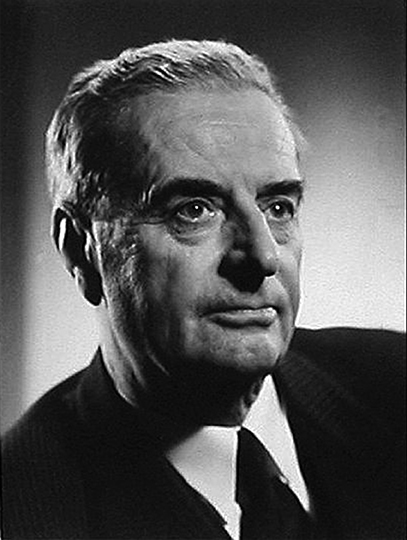 During his early work with the French type house, Frutiger was engaged in the conversion of existing metal type designs for the newly emerging phototypesetting technologies. 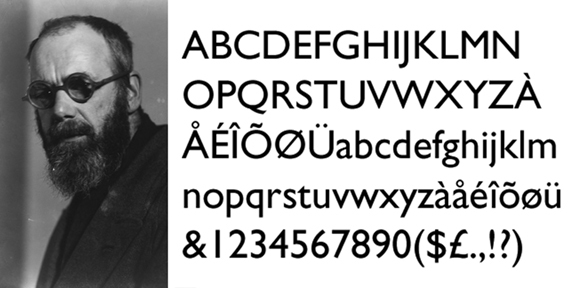 He also designed several new typefaces— Président, Méridien, and Ondine—in the early 1950s. San serif type is a product of the twentieth century. Also known as grotesque (or grotesk), san serif fonts emerged with commercial advertising, especially signage. The original san serif designs (beginning in 1898) possessed qualities—lack of lower case letters, lack of italics, the inclusion of condensed or extended widths and equivalent cap and ascender heights—that seemingly violated the rules of typographic tradition. As such, these early san serif designs were often considered too clumsy and inelegant for the professional type houses and their clients. Along with the modern art and design movements of the early twentieth century, a reconsideration of the largely experimental work of the first generation of sans serif types began in the 1920s. 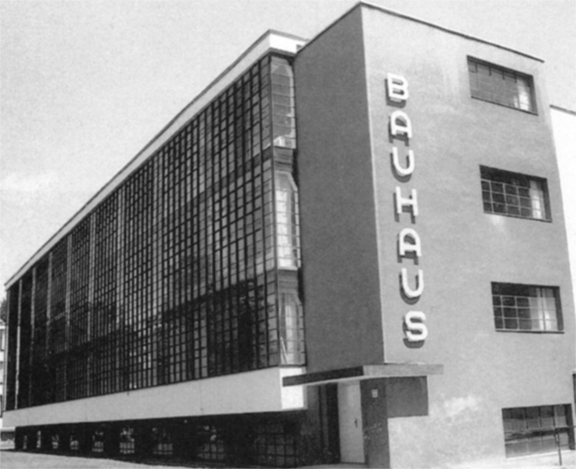 Fonts such as Futura, Kabel and Gill Sans incorporated some of the theoretical concepts of the Bauhaus and DeStijl movements and pushed sans serif to new spheres of respectability. However, these fonts—which are still used today—did not succeed in elevating san serif beyond headline usage and banner advertising and into broader application. Sans serif type remained something of an oddity and not yet accepted by the traditional foundry industry as viable in terms of either style or legibility. In the 1930s, especially within the European countries that fell to dictatorship prior to and during World War II, there was a backlash against modernist conceptions. Sans serif type came under attack, was derided as “degenerate” and banned in some instances. Exceptions to this trend were in the US, where the use of grotesque types was increasing, and Switzerland, where the minimalist typographic ideas of the Bauhaus were brought by designers who had fled the countries ruled by the Nazis. After the war, interest in sans serif type design was renewed as a symbol of modernism and a break from the first four decades of the century. By the late 1950s, the most successful period of san serif type opened up and the epicenter of this change emerged in Switzerland, signified by the creation of Helvetica (1957) by Eduard Hoffmann and Max Miedinger of the Haas Type Foundry in Münchenstein. It was the nexus of the creative drive to design the definitively “modern” typeface and the possibilities opened up by the displacement of metal type with phototypesetting that brought san serif from a niche font into global preeminence. 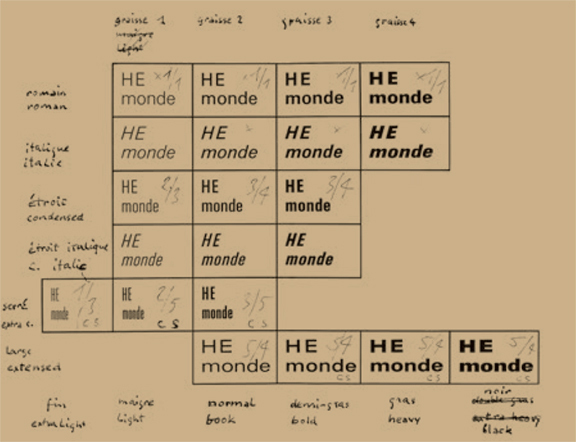 Originally calling his type design “Monde” (French for “world”), Frutiger’s innovation was that he designed 21 variations of Univers from the beginning; for the first time in the history of typography a complete set of typefaces were planned precisely as a coherent system. 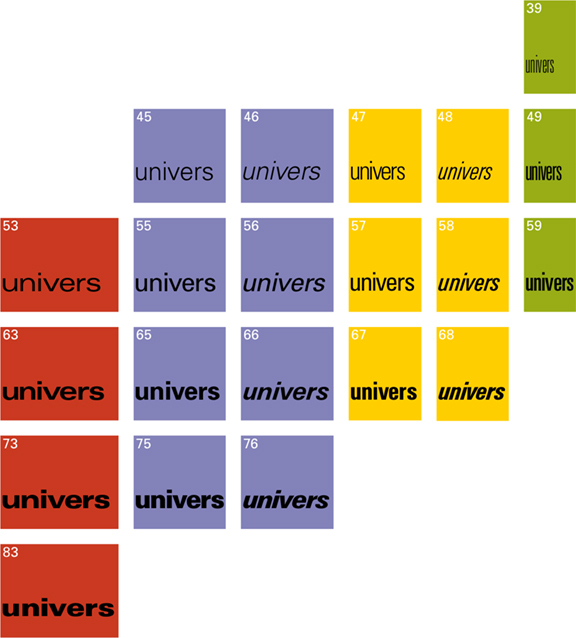 He also gave the styles and weights a numbering scheme beginning with Univers 55. The different weights (extended, condensed, ultra condensed, etc.) were numbered in increments of ten, i.e. 45, 65, 75, 85 and styles with the same line thickness were numbered in single digit increments (italics were the even numbers), i.e. 53, 56, 57, 58, 59, etc. Univers was released by Deberny & Peignot in 1957 and it was quickly embraced internationally for both text and display type purposes. Throughout the 1960s and 70s, like Helvetica, it was widely used for corporate identity (GE, Lufthansa, Deutsche Bank). It was the official promotional font of the 1972 Munich Olympic Games. Had Adrian Frutiger retired at the age of 29 after designing Univers, he would have already made an indelible contribution to the evolution of typography. However, his work was by no means complete. By 1962, Frutiger had established his own graphic design studio with Bruno Pfaffli and Andre Gurtler in Arcueil near Paris. This firm designed posters, catalogs and identity systems for major museums and corporations in France. Throughout the 1960s, Frutiger continued to design new typefaces for the phototypesetting industry such as Lumitype, Monotype, Linotype and Stempel AG. Among his most well-known later san serif designs were Frutiger, Serifa and Avenir. Frutiger’s font systems can be seen to this day on the signage at Orly and Charles de Gaulle airports and the Paris Metro. 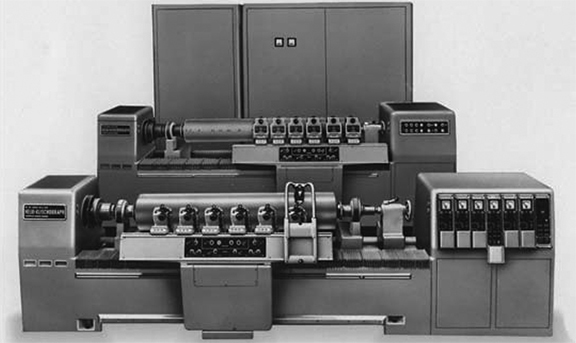 The penetration of computers and information systems into the printing and publishing process were well underway by the 1960s. In 1961, thirteen computer and typewriter manufacturers founded the European Computer Manufacturers Association (ECMA) based in Geneva. A top priority of the EMCA was to create an international standard for optical character recognition (OCR)—a system for capturing the image of printed information and numbers and converting them into electronic data—especially for the banking industry. By 1968, OCR-A was developed in the US by American Type Founders—a trust of 23 American type foundries—and it was later adopted by the American National Standards Institute. This was the first practically adopted standard mono-spaced font that could be read by both machines and the human optical system. However, in Europe the ECMA wanted a font that could be used as an international standard such that it accommodated the requirements of all typographic considerations and computerized scanning technologies all over the world. Among the issues, for example, were the treatment of the British pound symbol (£) and the Dutch IJ and French oe (œ) ligatures. Other technical considerations included the ability to integrate OCR standards with typewriter and letterpress fonts in addition to the latest phototypesetting systems. In 1963, Adrian Frutiger was approached by representatives of the ECMA and asked to design OCR-B as an international standard with a non-stylized alphabet that was also esthetically pleasing to the human eye. 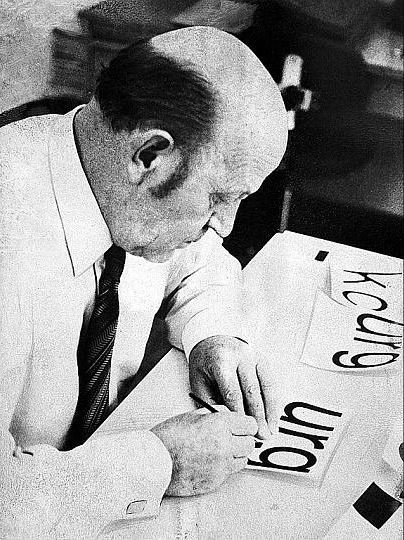 Over the next five years, Frutiger showed the exceptional ability to learn the complicated technical requirements of the engineers: the grid systems of the different readers, the strict spacing requirements between characters and the special shapes needed to make one letter or number optically distinguishable from another. 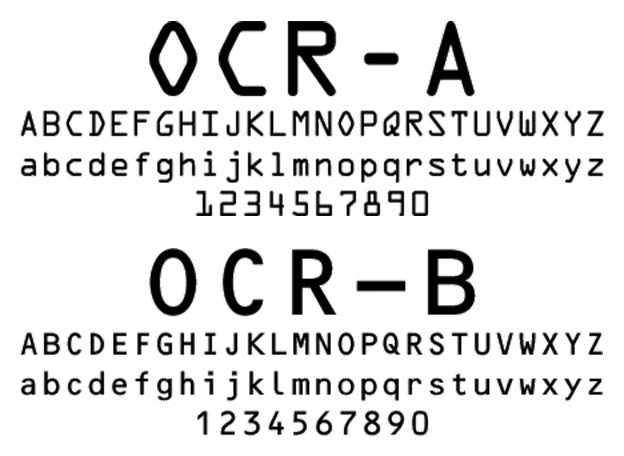 In 1973, after multiple revisions and extensive testing, Adrian Frutiger’s OCR-B was adopted as an international standard. Today, the font can be most commonly found on UPC barcodes, ISBN barcodes, government issued ID cards and passports. Frutiger’s OCR-B font will no doubt live on into the distant future—alongside various 2D barcode systems—as one of the primary means of translating analog information into digital data and back again. Adrian Frutiger’s type design career extended well into the era of desktop publishing, PostScript fonts and the Internet age. 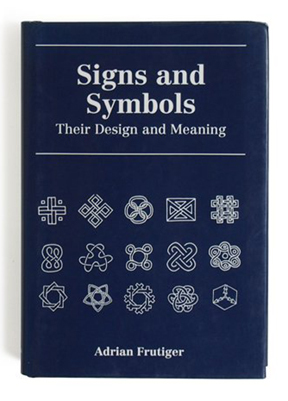 In 1989, Frutiger published the English translation of Signs and Symbols: Their Design and Meaning a theoretical and retrospective study of the two-dimensional expression of graphic drawing with typography among its most advanced forms. For someone who spent his life working on the nearly imperceptible detail of type and graphic design, Frutiger exhibited an exceptional grasp of the historical and social sources of man’s urge toward pictographic representation and communication. On Friday, June 12, Apple released its San Francisco system font for OSX, iOS and watchOS. Largely overlooked amid the media coverage of other Apple product announcements, the introduction of San Francisco was a noteworthy technical event. San Francisco is a neo-grotesk, sans serif and Pan European typeface with characters in Latin as well as Cyrillic and Greek scripts. It is significant because it is the first font to be designed specifically for all of Apple’s display technologies. Important variations have been introduced into San Francisco to optimize its readability on Apple desktop, notebook, TV, mobile and watch devices. It is also the first font designed by Apple in two decades. San Francisco extends Apple’s association with typographic innovation that began in the mid-1980s with desktop publishing. From a broader historical perspective, Apple’s new font confirms of the ideas developed more than fifty years ago by renowned calligrapher and type designer Hermann Zapf. Sadly, Zapf died at the age of 96 on June 4, 2015 just one week before Apple’s San Francisco announcement. Hermann Zapf’s contributions to typography are extensive and astonishing. He designed more than 200 typefaces—the popular Palatino (1948), Optima (1952), Zapf Dingbats (1978) and Zapf Chancery (1979) among them—including fonts in Arabic, Pan-Nigerian, Sequoia and Cherokee. Meanwhile, Zapf’s exceptional calligraphic skills were such that he famously penned the Preamble of the Charter of the United Nations in four languages for the New York Pierpont Morgan Library in 1960. 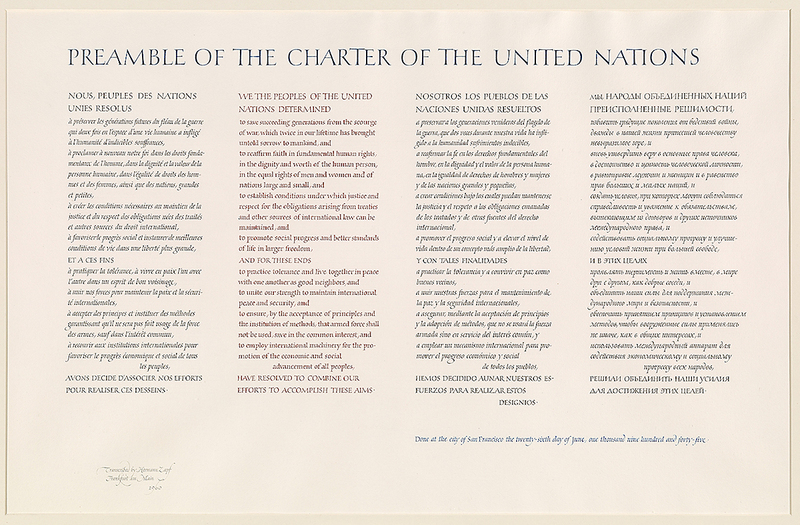 Zapf’s calligraphic skills were called upon for the republication of the Preamble of the UN Charter in 1960 for the Pierpont Morgan Library in New York City. While he made many extraordinary creative accomplishments—far too many to list here—Hermann Zapf’s greatest legacy is the way he thought about type and its relationship to technology as a whole. 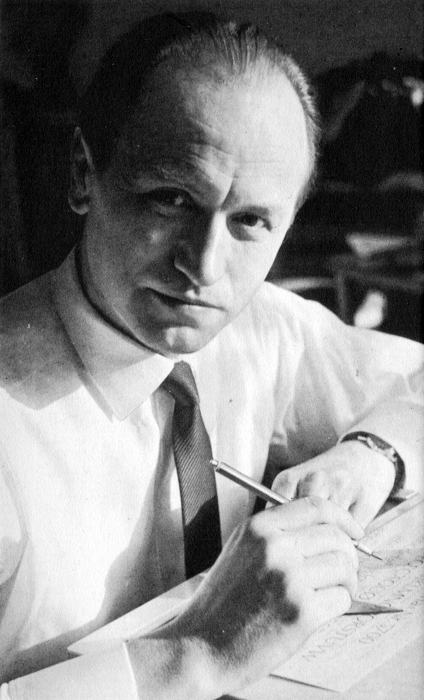 Herman Zapf was among the first and perhaps the most important typographers to theorize about the need for new forms of type driven by computer and digital technologies. At school, Hermann took an interest in technical subjects. He spent time in the library reading scientific journals and at home, along with his older brother, experimenting with electronics. He also tried hand lettering and created his own alphabets. 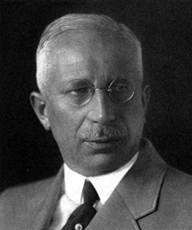 Hermann left school in 1933 with the intention of becoming an engineer. However, economic crisis and upheaval in Germany—including the temporary political detention of his father in March 1933 at the prison camp in Dachau—prevented him from pursuing his plans. Barred from attending the Ohm Technical Institute in Nuremberg for political reasons, Hermann sought an apprenticeship in lithography. He was hired in February 1934 to a four-year apprenticeship as a photo retoucher by Karl Ulrich and Company. 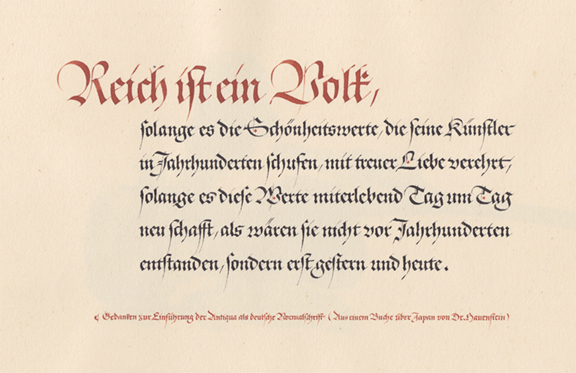 In 1935, after reading books by Rudolf Koch and Edward Johnson on lettering and illuminating techniques, Hermann taught himself calligraphy. When management saw the quality of Hermann’s lettering, the Ulrich firm began to assign him work outside of his retouching apprenticeship. Hermann refused to take the test at his father’s insistence on the grounds that the training had been interrupted by many unrelated tasks. He never received his journeyman’s certificate and left Nuremburg for Frankfurt to find work. 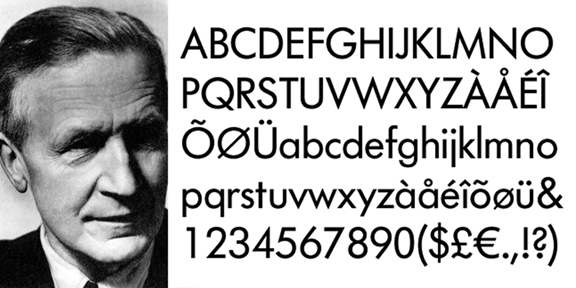 Hermann Zapf was conscripted in 1939 and called up to serve in the German army near the town of Pirmasens on the French border. After a few weeks, he developed heart trouble and was transferred from the hard labor of shovel work to the writing room where he composed camp reports and certificates. When World War II started, Hermann was dismissed for health reasons. In April 1942 he was called up again, this time for the artillery. Hermann was quickly reassigned to the cartographic unit where he became well-known for his exceptional map drawing skills. He was the youngest cartographer in the German army through the end of the war. An example of calligraphy from the sketchbook that Hermann Zapf kept during World War II. In the years following the war, Hermann taught and gave lessons in calligraphy in Nuremberg. In 1947, he returned to Frankfurt and took a position with the Stempel AG foundry with little qualification other than his sketch books from the war years. From 1948 to 1950, while he worked at Stempel on typography designs for metal punch cutting, he developed a specialization in book design. Hermann also continued to teach calligraphy twice a week at the Arts and Crafts School in Offenbach. 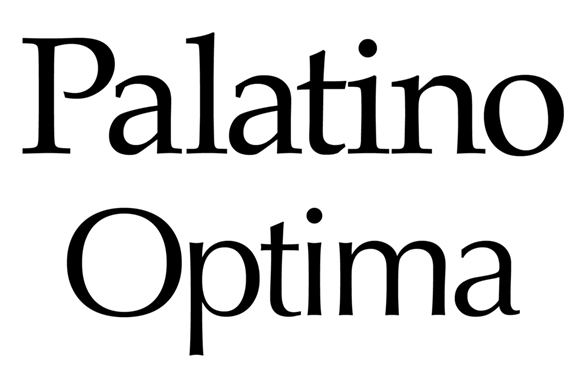 It was during these years, that Zapf designed Palatino and Optima. Working closely with the punch cutter August Rosenberg, Hermann design Palatino and named it after the 16th century Italian master of calligraphy Giambattista Palatino. In the Palatino face, Zapf attempted to emulate the forms of the great humanist typographers of the Renaissance. Optima, on the other hand, expressed more directly the genius of Zapf’s vision and foreshadowed his later contributions. Optima can be described as a hybrid serif-and-sans serif typeface because it blends features of both: serif-less thick and thin strokes with subtle swelling at the terminals that suggest serifs. Zapf designed Optima during a visit to Italy in 1950 when he examined inscriptions at the Basilica di Santa Croce in Florence. It is remarkably modern, yet clearly derived from the Roman monumental capital model. By the time Optima was released commercially by Stempel AG in 1958, the industry had begun to move away from metal casting methods and into phototypesetting. As many of his most successful fonts were reworked for the new methods, Zapf recognized—perhaps before and more profoundly than most—that phototypesetting was a transitional technology on the path from analog to an entirely new digital typography. To grasp the significance of Zapf’s work, it is important to understand that, although “cold” photo type was an advance over “hot” metal type, both are analog technologies, i.e. they require the transfer of “master” shapes from manually engraved punches or hand drawn outlines to final production type by way of molds or photomechanical processes. Due to the inherent limitations of metal and photomechanical media, analog type masters often contain design compromises. Additionally, the reproduction from one master generation to the next has variations and inconsistencies connected with the craftsmanship of punch cutting or outline drawing. With digital type, the character shapes exist as electronic files that “describe” fonts in mathematical vector outlines or in raster images plotted on an XY coordinate grid. With computer font data, typefaces have many nuances and features that could never be rendered in metal or photo type. Meanwhile, digital font masters can be copied precisely without any quality degradation from one generation to the next. 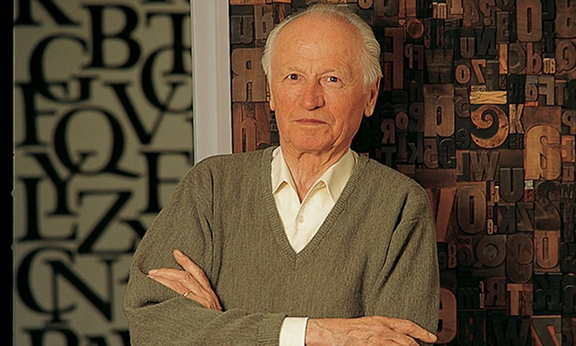 From the earliest days of computers, Hermann Zapf began advocating for the advancement of digital typography. He argued that type designers needed to take advantage of the possibilities opened up by the new technologies and needed to create types that reflected the age. Zapf also combined knowledge of the rules of good type design with a recognition that fonts needed to be created specifically for electronic displays (at that time CRT-based monitors and televisions). Despite a very cold response in Germany—his ideas about computerized type were rejected as “unrealistic” by the Technical University in Darmstadt where he was a lecturer and by leading printing industry representatives—Hermann persevered. 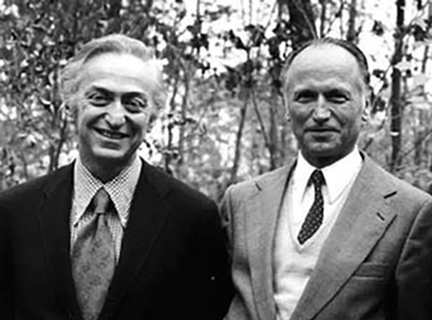 Beginning in the early 1960s, Zapf delivered a series of lectures in the US that were met with enthusiasm. For example, a talk he delivered at Harvard University in October 1964 became so popular that it led to an offer for a professorship at the University of Texas in Austin. The governor even also made Hermann an “Honorary Citizen of the State of Texas.” In the end, Zapf turned down the opportunity due to family obligations in Germany. When digital typography was born in 1964 with the Digiset system of Rudolf Hell, Hermann Zapf was involved. By the early 1970s, Zapf created some of the first fonts designed specifically for any digital system: Marconi, Edison, and Aurelia. In 1976, Hermann was asked to head a professorship in typographic computer programming at Rochester Institute of Technology (RIT) in Rochester, New York, the first of its kind in the world. 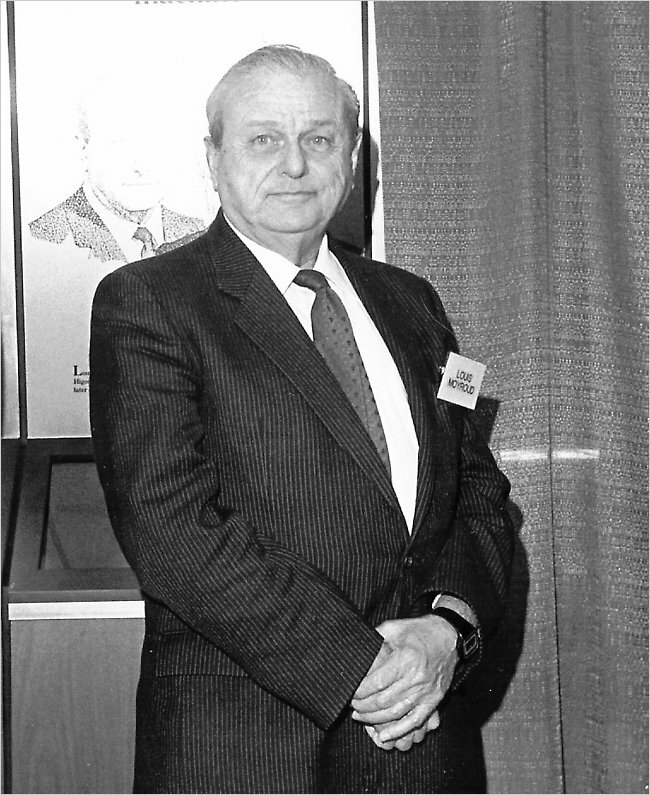 Zapf taught at RIT for ten years and was able to develop his conceptions in collaboration with computer scientists and representatives of IBM and Xerox. In 1977, Zapf partnered with graphic designers Herb Lubalin and Aaron Burns and founded Design Processing International, Inc. (DPI) in New York City. The firm developed software with menu-driven typesetting features that could be used by non-professionals. The DPI software was focused on automating hyphenation and justification as opposed to the style of type design. In 1979, Hermann began a collaboration with Professor Donald Knuth of Stanford University to develop a font that was adaptable for mathematical formulae and symbols. 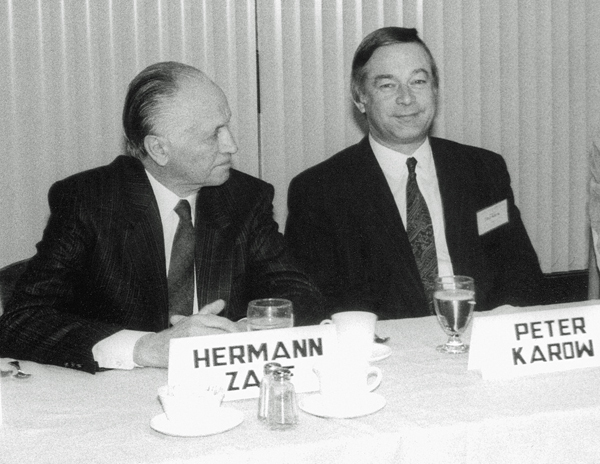 In the 1990s, Hermann Zapf continued to focus on the development of professional typesetting algorithms with his “hz -program” in collaboration with Peter Karow of the font company URW. Eventually the Zapf composition engine was incorporated by Adobe Systems into the InDesign desktop publishing software. Hermann Zapf actively participated—into his 70s and 80s—in some of the most important developments in type technology of the past fifty years. This was no accident. He possessed both a deep knowledge of the techniques and forms of type history and a unique appreciation for the impact of information technologies on the creation and consumption of the written word. More than 40 years before the Apple design team set out to create a font that is legible on multiple computer screens, the typography visionary Hermann Zapf was theorizing about the very same questions. Today’s digital and mobile wireless technologies are in a constant state of flux. As we pass the midpoint of 2015, the human computer interface is being once again transformed with haptic technology—tactile feedback from a device such as force or vibration. If you have felt vibration in response to a touch function on your smartphone, then you have experienced haptics. What was until recently available only to virtual reality enthusiasts and gamers, is now a feature of every smartphone and tablet. Technical evolution has been so fast that it is hard to believe smartphones have been around for less than eight years and the tablet is just a little over three years old. As we try to keep up with the pace of change, it is easy to miss the fact that the electronics revolution has been underway for more than a century and digital electronics represents less than half of that time period. Electronic technology can be divided into two basic forms: analog and digital. Long before there were microprocessors and memory chips that exchange all information, data, code, signals, etc. in a series of zeroes and ones, there were analog electronics such as resistors, capacitors, inductors, diodes and transistors. The difference between a clock with hour, minute and second hands rotating around the face and the numerals on an Light Emitting Diode (LED) clock display is a simple illustration of analogue vs digital technology. John Crosfield’s contributions to printing and the graphic arts spanned both analogue and digital electronics. His analogue systems were developed in the late 1940s and became dominant in the industry throughout the 1950s. When the first computers were introduced in the 1960s, Crosfield pioneered digital electronics and became a major worldwide provider of equipment into the 1960s and mid-70s. John Fothergill Crosfield was born into a well-off family. He was the third child and second son of prominent English Quakers. Born on October 22, 1915 in Hampstead, London—a community known for its intellectual, liberal, artistic, musical and literary associations—John had five siblings. John’s father, Bertram Fothergill Crosfield, was managing director and co-proprietor of the News Chronical and The Star, both liberal daily newspapers in London. Bertram was also leader of several Hampstead organizations. John’s mother, Eleanor Cadbury, was the daughter of the famous chocolate maker and leading Quaker, George Cadbury. Eleanor was well-known independently of her father and was elected as a Liberal to Bucks County Council. John showed an early interest in building things. As a boy, he was often busy in the family workshop making boats, steam engines and other mechanical devices. He once built a cannon and tested it on the garage door. The projectile went through the door and damaged his father’s Daimler. He was fond of trains and, with the assistance of a childhood friend, built an O gauge model railroad on the property of his school grounds. At age 13 John was enrolled in Leighton Park School, a Quaker establishment. He enjoyed studying physics and math and decided he wanted to pursue engineering at college. Following in his father’s footsteps, John enrolled at Trinity College Cambridge. He designed and built gliders and other flying machinery such as a winch launcher in his spare time. Although he had many hobbies, John was an exceptional student and put most of his time into his studies. 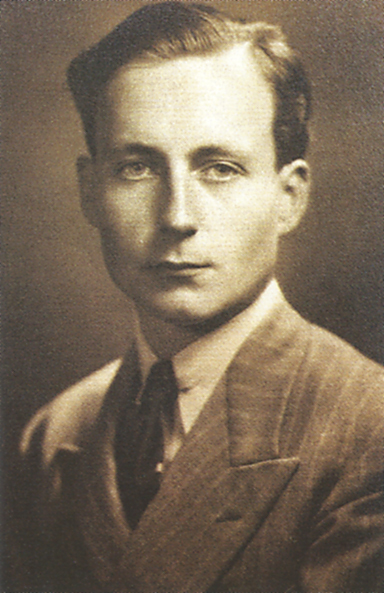 John graduated from Cambridge in 1936 and went to Munich, Germany to improve his language skills. He came into contact with anti-Semitism and Nazi propaganda and was horrified by Hitler’s methods. Upon his return to England, John’s accounts of the treatment of political prisoners in Germany were met with disbelief. John Crosfield was a member of a generation of engineers whose formative experiences were made in World War II. Much of the technology advancements that were deployed throughout industry in the post war period originated in the struggle by the warring countries for military supremacy. After he left Cambridge, Crosfield took a student-apprentice engineering position with British Thomson-Hudson (BTH), a heavy industry firm based in Warwickshire. BTH was founded as a subsidiary of the US-based General Electric Company (GE) and specialized in steam turbines. 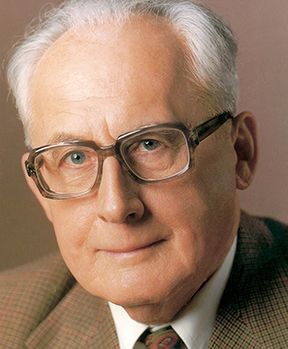 In 1938, he left BTH and went to work at the Stockholm facility of ASEA, a Swedish version of BTH and GE. When the war began in 1939, John made his way back to England and planned to join the Navy. Crosfield used some connections at ASEA to get an assignment by the Admiralty to the Mine Design Department. It was here that Crosfield’s electronic genius would begin to be expressed. He worked on a magnetic mine project that could detect German boats near British harbors. Crosfield also designed and built a prototype of an acoustic mine that could pick up on the sound of the propeller of wooden German E-boats. The acoustic mine became a success with 200 being deployed in the Baltic Sea and sinking 47 enemy vessels. Crosfield and his colleagues later worked on the development of both acoustic and subsonic mines. He got involved in the production process and in 1944 Crosfield’s inventions proved extremely effective in major battles at the Straits of Dover and the Western Approaches. After the war, John Crosfield decided—after having learned from his experience at ASEA that some of the projects that he had worked on would never be funded—to start his own business. In 1947, he set up a lab in Hampstead and began working on new projects. He later recalled that in 1945, while he was in charge of electronics research for the Admiralty, he was approached by a printing industry representative about the problem of color registration on high speed rotogravure magazine presses. There was a need for an automated system to align all the process colors in the printed page to improve quality and reduce press waste. With about £2,000 of his own money and another £2,500 borrowed from family members, Crosfield set out to design an electronic and automated registration system for color printing. After 18 months of hard work, the “Autotron” was tested as a prototype on the production of Women’s Weekly at Amalgamated Press in London. 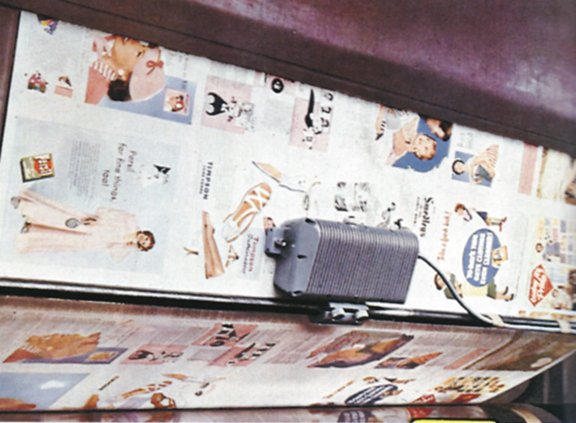 Prior to the Autotron, a magazine production run would often waste 25-30% of the impressions using manual controls. Crosfield’s automatic register system brought the waste figures down to 4-5%. The Autotron consisted of a scanning heads mounted on each printing unit and a control cubicle that was located away from the press. The scanning heads picked up “register marks”—unobtrusive symbols on the printed page that were hidden from view—to regulate the movement of the printed image from unit to unit with an accuracy of one thousandth (1/1000) of an inch. Word about the Autotron travelled quickly in the printing industry and Crosfield was soon taking prepaid orders from companies in Britain. An opportunity to show the system at the British Industries Fair in 1949 made Autotron an international phenomenon and orders were quickly being placed from printers in countries around the world. The success of the Autotron encouraged John Crosfield to invest in further research in pressroom automation for gravure magazine printing and other presses such as offset newspaper and packaging print. Secatron: an optical system for packaging printers that kept images in the right position on the cardboard so they would look right on the finished carton. Webatron: a system similar to Autotron for high speed presses that regulated the movement of paper through the press for delivery to folders and sheeters. Trakatron: a system for regulating print on web-fed cellophane and wax paper presses. Idotron: a system for measuring ink density on a web press to keep color reproduction consistent during press runs. Viscomex: an ink viscosity control system that added solvents to the ink automatically as needed as a result of evaporation. Flying Paster: an automatic splicing mechanism that enabled production to go from one roll of paper to the other without slowing down or stopping the press. Many of these systems relied upon photo-electric cells to detect movement of paper or printed images on the paper. Crosfield’s expertise in the area of optical sensors lead him to several other important breakthroughs in the composition and preparatory stages of print production. These developments took place in an environment of intense global competition with companies in Europe, the US and Middle East. 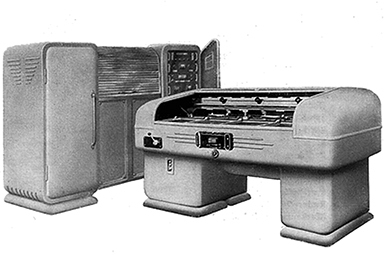 The Crosfield Lumitype 450 was the first phototypesetting system designed and built in Europe. It was licensed to Crosfield by the US based Photon. 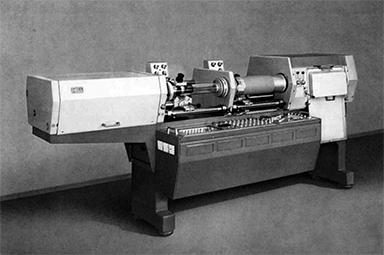 By the 1960s, the printing industry had been moving rapidly into offset lithography. A major factor in this regard was the displacement of hot metal typesetting with cold type, i.e. phototypesetting systems. 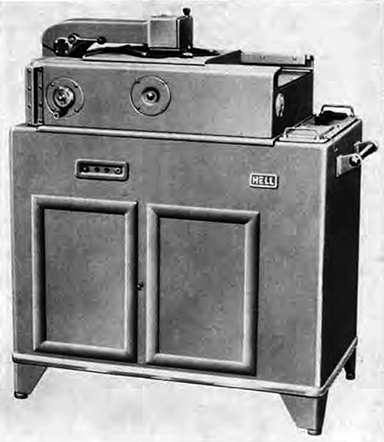 While Crosfield was not the inventor of the first phototypesetter, his company was a designer and builder of the Lumitype 540 under patents from the original inventors at Photon in the US. This relationship would continue through the development of the high speed Photon 713 in 1965, which was the first computer controlled phototypesetting system. 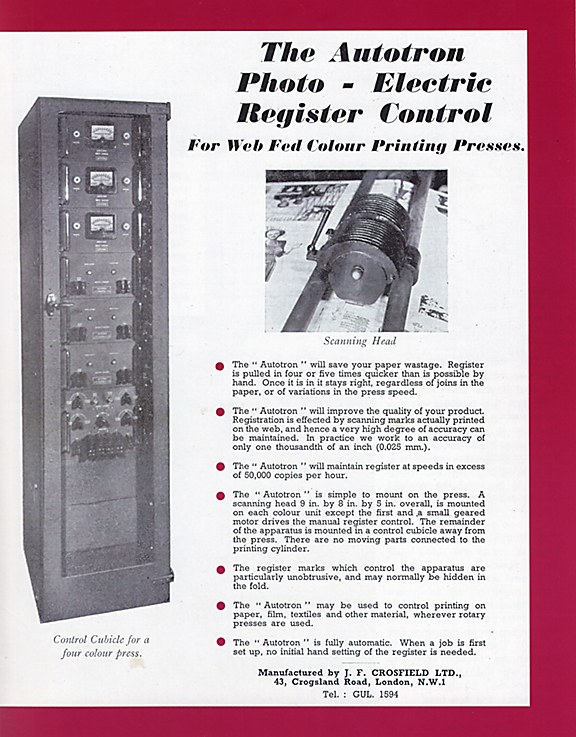 Among the greatest successes of Crosfield Electronics, Ltd. was its color scanning systems. The Crosfield Scanatron—which was developed in 1958—was the first scanning technology that could make color corrections and eliminate the time-consuming work of retouchers. The Crosfield Magnascan was the first color scanning device that could retouch color electronically. Crosfield continued with advancements in color scanning throughout the 1960s. 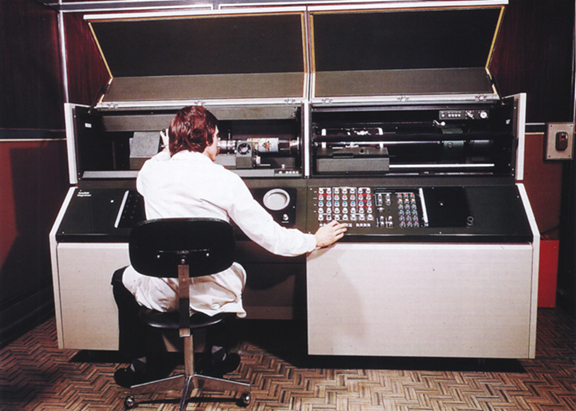 The Magnascan was introduced in 1969 and it was capable of scanning a color transparency. It also had the software capability to adjust the size, form, color and hue such that the printed image was of the finest quality anywhere. While the Magnascan was an international success, it was developed at the same time as Rudolf Hell’s Chromograph. Recognizing that a battle over who invented and patented the drum scanner first, the two men signed an agreement giving cross licenses for a modest royalty. Crosfield and Hell remained good friends from that point forward. In addition to accomplishments in the graphic arts, Crosfield Electronics Limited (CEL). also developed computerized business systems and—leveraging the expertise in optical devices—invented a very successful automated bank note sorting and processing technology. While the company was very successful in the printing market, an attempt to take CEL public in 1974 was made during a collapse of the stock exchange and Crosfield ended up selling his business to De La Rue. The color scanning segment of his business—the most profitable aspect of CEL—was sold by De La Rue in 1989 to a joint venture of Fuji and DuPont called Fujifilm Electronics Imaging. With the introduction of the desktop PC—and especially the desktop publishing system associated with the Apple Macintosh computer in 1985 and shortly thereafter desktop flatbed scanners—Crosfield’s era graphic arts electronics had come to a close. 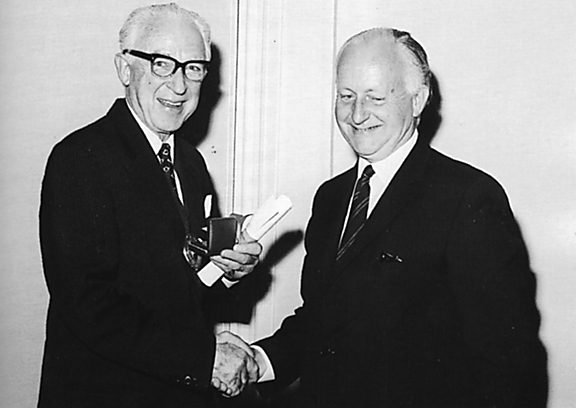 John Crosfield received many accolades for his contributions to the printing industry over nearly five decades, including four United Kingdom Queen’s Awards and the gold medal of the Institute of Printing in 1973. 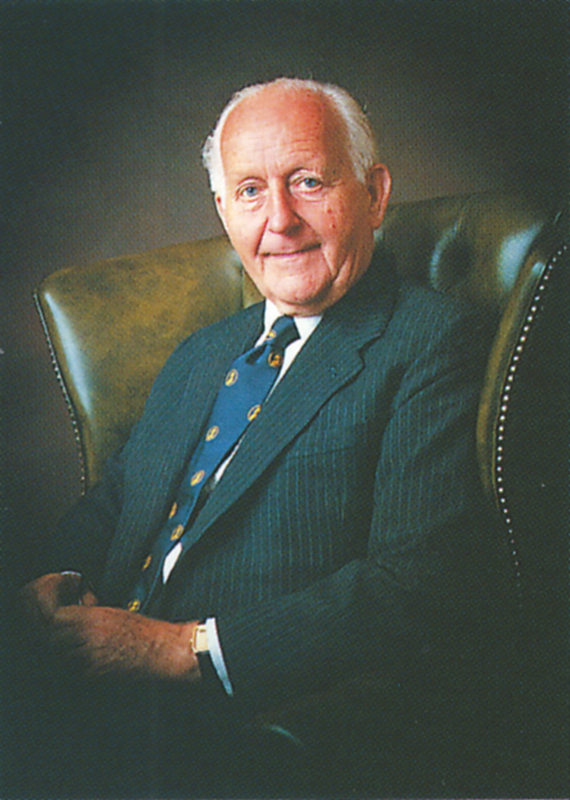 He remained a board member of De La Rue until 1985 and thereafter was Honorary President of CEL. A very modest, personable and generous man, John Crosfield died on March 25, 2012 at his home in Hampstead at age 96. In 1978, when I was a senior in high school, my art teacher gave me some graphic design magazines. Knowing I loved art and design, he told me “Hold on to these. They will be worth something one day.” What he gave me was a nearly complete set of Avant Garde, an innovative arts and culture magazine published between January 1968 and July 1971. At the time, I could not have understood the significance of these magazines or what they were all about. So, I browsed through them a couple of times and then stuck them in a box. And there they sat for 35 years until a few months ago when I dug them out started looking through them again. If you know something about the social and cultural climate in America during 1968-71, you can probably figure out what the magazine was about. 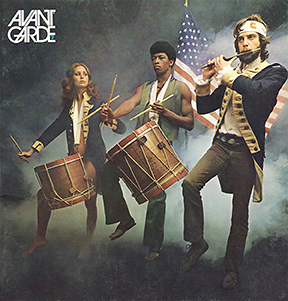 For example, issue number 7 from March 1969 had a front cover photograph that is a parody of Archibald Willard’s famous patriotic painting “The Spirit of ’76”; Carl Fischer’s version of the image includes a white woman and a black man as two of the three Minutemen from the American Revolution. Most importantly, however, Avant Garde was a breakthrough publication creatively; during its four years of existence, it was the cutting edge of graphic design, especially typography. 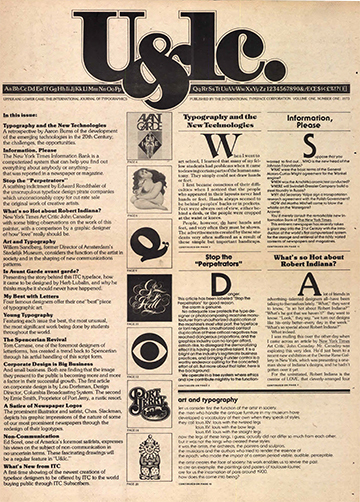 This is not hard to believe when you learn that the magazine’s art director was Herb Lubalin, one of the most important American graphic and type designers of the 1960s and 1970s. 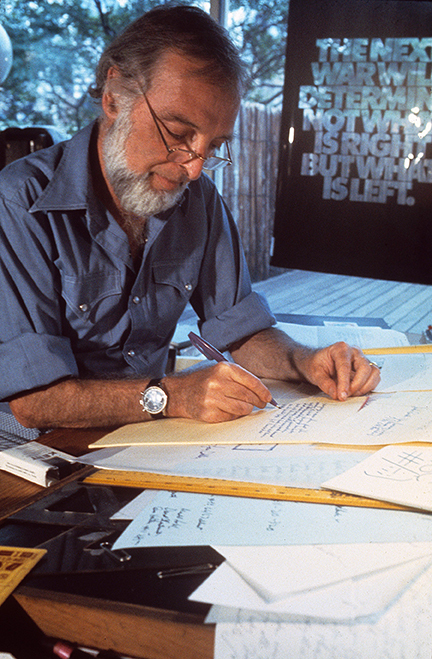 Herbert F. Lubalin was born in New York City on March 17, 1918. As a high school student he did not show a particular interest in the graphic arts, although he liked to draw. He entered art school at Cooper Union at the age of 17 where his interest in typography was nurtured. Herb graduated in 1939 and first worked as a freelance designer and typographer. It has been reported that he was fired from a position at a display company after he requested a two-dollar raise on his weekly eight-dollar salary. Soon thereafter, and for the next twenty-five years, Lubalin worked as an art director for advertising agencies. The New York City firms he worked for included Deutsch & Shea, Fairchild Publications, Reiss Advertising and Sudler & Hennessey. During these years, Lubalin established himself as a genius of what would be later called “typographics” or “expressive typography,” i.e. words and letters as imagery with verbal and conceptual twists. This was achieved through a meticulous creative approach to advertisements, trademarks and logos, posters, magazines and packaging design. In 1952, Herb won a New York Art Directors Club Gold Medal as creative director at Sudler & Hennessey, the first of hundreds of awards he would receive during his career. 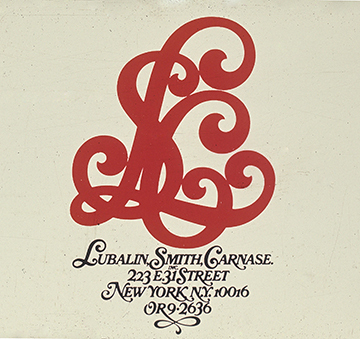 After leaving Sudler in 1964, he established his own graphic design consultancy called Herb Lubalin, Inc. This was the first of multiple businesses and subsidiaries that Lubalin would found in both the US and Europe over the next two decades. In 1970, along with Aaron Burns and Edward Ronthaler, Lubalin created the International Typeface Corporation (ITC), one of the world’s first type foundries that had no history in hot metal type design. In terms of the technology of type, this was the age of phototypesetting. The replacement of hot type with cold type meant that a new library of modern fonts could be developed. It also meant that type forms could be manipulated in ways that were extremely difficult, if not impossible, with the metal casting. Although Lubalin’s ITC took up the task of preserving and reviving old classic faces such as ITC Bookman and ITC Garamond, the foundry also specialized in modern sans serif fonts such as ITC Franklin, ITC American Typewriter, ITC Kabel and ITC Bauhaus among many others. Herb Lubalin’s relationship with Ralph Ginzburg—who was convicted in 1963 for violating US obscenity laws—was noteworthy. The two worked together on three of groundbreaking magazines: Eros (1962), Fact: (January 1964–August 1967) and the aforementioned Avant Garde. 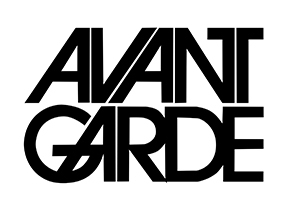 Avant Garde magazine proved to be most significant for Lubalin, specifically for his design of the publication nameplate. The Avant Garde moniker became so popular that Lubalin, his partner Tom Carnase and the type designer Edward Benguiat developed an entire font set from it. What became the Avant Garde Gothic type design included a series of ligatures (combinations of two letters into one type element), an innovative development for a sans serif font. Officially launched by ITC in 1970, Avant Garde Gothic became one of the most popular typefaces of the era. Although it came under criticism and was eschewed by the post-modernist graphic design community for its structural and grid-like consistency, Avant Garde Gothic was eventually included in the set of 35 base fonts on the Adobe PostScript print engine that was launched in the 1980s. For this reason, Avant Garde Gothic continues to be one of the most popular and often used alternatives to Helvetica. Herb Lubalin designed some of the most memorable and lasting images of expressive typography that have ever been created. His publication nameplate for “Mother & Child,” logo for L’eggs and logo for the World Trade Center are part of iconic graphic design history. Herb Lubalin had a near legendary reluctance to talk with anyone, especially the media and trade publications, about his work and some interpreted his reserved character as a lack of intellectual acumen. However, Lubalin was a very sharp advocate of his approach to his craft and he was not averse to sharing his knowledge with those who wanted to learn, particularly students. In 1973, Lubalin launched, became editor and art director of International Typeface Corporation’s quarterly in-house publication called U&lc (Upper and lower case). The journal became an instant force in the industry and rapidly built up a subscription circulation of 170,000 readers. 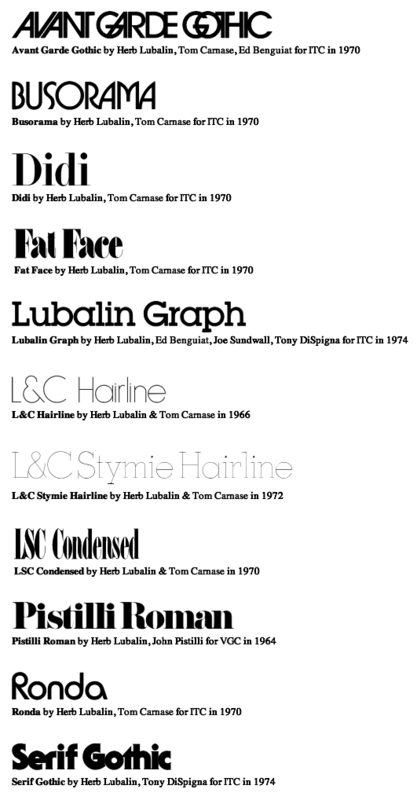 It was in U&lc that some of Lubalin’s conceptions about graphic and type design can be studied and learned about. Beginning in 1972, Lubalin began teaching graphic design at Cornell University and starting in 1976 he taught a course at Cooper Union where he remained until his death on May 24, 1981 at New York University Hospital. I recently searched for copies of Avant Garde magazine on eBay and found that my high school art teacher was right about how they would be worth something. Although a full set of 14 editions is only going for several hundred dollars, I’m glad I still have my copies of an important piece of modern graphic and type design history. It is a fact of typographic history that the font Helvetica exists today because of Hamburgers … but not the food “Hamburgers.” Eduard Hoffmann, the creator of the ubiquitous typeface, knew the word “Hamburgers” contained the complete range of character attributes in the alphabet; he knew that from this one word the quality of a typeface design could be evaluated, that the features of its anatomy could be examined. Helvetica is probably the most successful typeface in all of history. It is everywhere, all the time and there are reasons for this: Helvetica is neutral and easy to read; its different weights and styles effectively embody almost any meaning or message. Helvetica is plain but it is also modern and timeless. Helvetica came about when typography and printing technology were moving from the metal casting, mechanical and letterpress era to the electronic phototypesetting, word processing, laser imaging and computer age. It rode atop this transformation and became the first truly international typeface. By the mid-1960s, Helvetica emerged as a global standard for public signage, corporate identity and communications. A sampling of corporate identities that use Helvetica. Regardless of one’s personal opinion of the esthetics and usefulness of Helvetica today, its creation and development—the people who developed it and how they developed it—is one of the most important accomplishments of twentieth century graphic arts. Eduard Hoffmann was born on May 26, 1892 in Zurich, Switzerland. As a student, he studied technology and engineering in Zurich, Berlin and Munich with a specific interest in aviation. In 1917, the 25-year-old Hoffmann took a position under the direction of his uncle Max Krayer at Haas’sche Schriftgiesserei (Haas Type Foundry) in Münchenstein, Switzerland and made a commitment to the profession of typography. 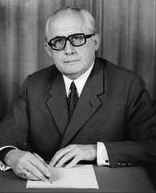 In 1937, Eduard became co-manager of the company with Krayer, and after his uncle’s death in 1944, became sole manager where he remained until his retirement in 1965. As early as 1950, Hoffmann made a decision to introduce a new sans serif typeface into the Swiss market that could compete with those coming from the other European countries. The origins of san serif typefaces date back to the late eighteenth century where it was used with an embossing technique to enable the blind to read. The first fully developed sans serif (also known as grotesque or grotesk) made its appearance in Germany around 1825 and a French type founder first used the term sans serif (without decorative extensions) in 1830. The sans serif types that Hoffmann wanted to compete with originally became popular and successful in the late nineteenth century. This was true of Akzidenz Grotesk of the Berlin-based H. Berthold AG type foundry, for example, which was originally designed in 1896. But there were neo-grotesk faces that had since entered the market, Bauer’s Folio and Frutiger’s Univers for example, that threatened to eclipse Hoffmann’s venture. Miedinger’s role in the process was decisive and many credit him more than Hoffmann for the creation of Helvetica. 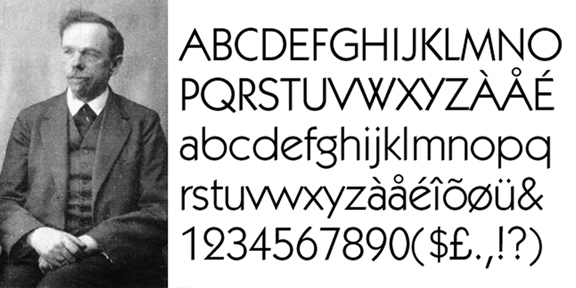 It is true that Miedinger made the original hand-drawn letters of the alphabet. But the esthetic component was only one side of the value that Miedinger brought to Haas. It was his in-depth knowledge and relationship with the customers of the type foundry that made Miedinger indispensible to the success of Neue Haas Grotesk and later Helvetica. Miedinger had access to some of the most brilliant Swiss graphic artists as well as advertising representatives from major Swiss corporations—the chemical firm J.R. Geigy AG among them—and through a painstaking and collaborative development process headed up by Hoffmann, Neue Haas Grotesk took shape. Throughout 1957 and 1958, the two men collaborated back and forth, fine-tuning each character. The record of the exchange between Hoffmann and Miedinger has been preserved and can be followed in detail in the book, Story of a Typeface: Helvetica forever. The book includes photographic reproductions of the letters the men wrote to each other as well as Hoffmann’s project notebook. A page from Eduard Hoffmann’s Helvetica notebook dated November 27, 1957. Hoffmann knew that designing a great typeface was not only about the beauty and logical construction of each individual character, even though this was an important aspect. Each character had to fit together with all the other characters in the various combinations that make letters into words. There was also the technical question of how the typeface would look at different sizes and once it was printed with ink on paper. Once they were satisfied with the basic letterforms and had designed enough weights and sizes—at that time, the Haas Type Foundry was punch cutting, engraving and typecasting by hand thousands upon thousands of individual characters in metal—the men took their product to market. With the help of some well-designed promotional brochures and an initial buzz at the Graphic 57 trade fair in Lausanne, Neue Haas Grotesk became a hit. By 1959, about ten percent of the printers in Switzerland were carrying it. The engraving room at the Haas Type Foundry. Lintoype ceased the type casting operations at Haas in 1989. 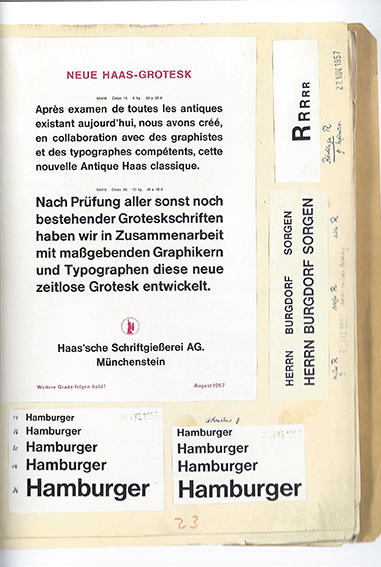 The Haas Type Foundry was majority-owned by the German firm D. Stempel AG. In turn, Stempel was in a contract with the multinational Linotype Corporation for the production of machine manufactured metal type forms. In order to expand the appeal of Hoffmann and Miedinger’s typeface and to bring it to the world of mass production typography, especially in the US, Linotype’s marketing department pushed for Neue Haas Grotesk to be renamed. Linotype initially suggested that it simply be named Helvetia (Latin for Switzerland). Hoffmann felt that, although it was distinctly a Swiss product, the typeface could not have the exact same name as the country. He came up with Helvetica, which means “The Swiss Typeface,” and all involved accepted the new name developed by its creator. Into the 1960s, Helvetica gained spectacular popularity and was adopted as the “in-house typeface” of various international corporations, many of which still use it to this day. Commentary on the significance and social driving force behind the success of Helvetica has often referred to post-war economic expansion. There was a thirst in the 1950s within the creative community for visual clues that conveyed optimism about the future. Designers wanted an excessively modern look that helped to put the bad memories of the first half the twentieth century far behind. For many, Helvetica accomplished this goal. In 1971, Eduard established a foundation with the aim of creating a museum dedicated to the printing industry. 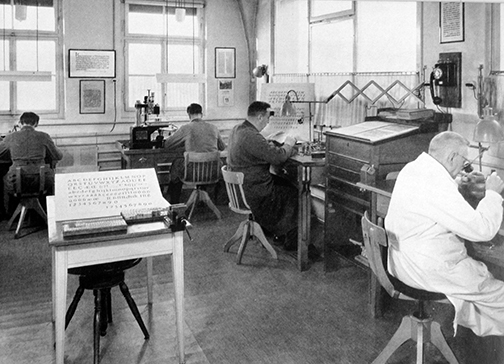 In 1980, in the former Gallician paper mill on the Rhine, the museum opened with Hoffmann’s collection of papers on the history of the Haas Type Foundry as one of its main attractions. Eduard Hoffmann died in Basel, Switzerland on September 17, 1980. 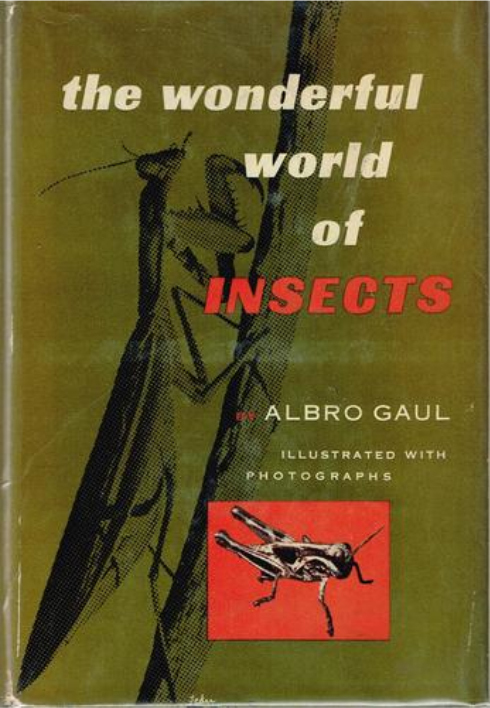 It is likely you have not read the 1953 edition of “The Wonderful World of Insects” by Albro Tilton Gaul. That’s OK. To be honest, I haven’t read it either. However, I do have a copy and I know that it is a very important book … not so much because it is about insects. “The Wonderful World of Insects” is important because it is the first book ever produced with phototypesetting. Prior to 1953, almost everything being printed used the casting method known as “hot type.” The mechanized production of molten metal type characters was first created by Gutenberg in the 1440s and his technique thrived for over 400 years. The system was revolutionized by Mergenthaler’s Linotype machine in the 1880s. Beginning in the 1940s, with the invention of “cold type” by Louis Moyroud and his fellow inventor Rene Higonnet, the typographic process was again being revolutionized. 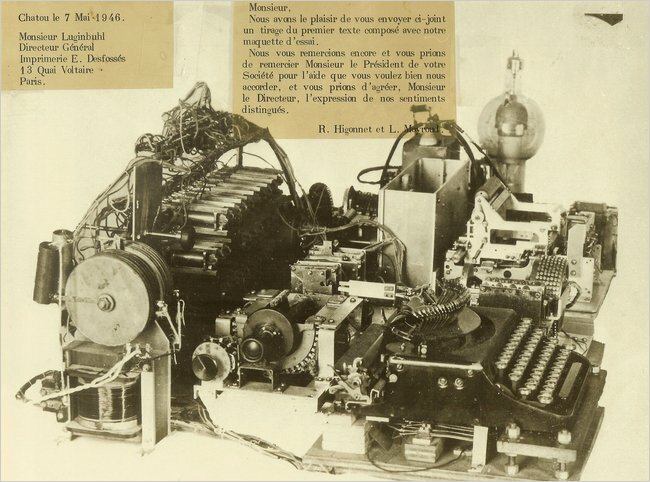 Moyroud and Higonnet’s breakthrough was significant because type creation went from being a mechanical to an electronic process. But more fundamentally, the two French engineers had initiated technologies that would later lead to a transformation of the graphic arts from analog to digital technology. This evolution is not complete. It continues developing to this day. 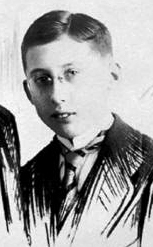 Louis Marius Moyroud was born on February 16, 1914 in Moirains, Isère, France and was the only child of Marius and Ann Marie Vial Moyroud. Louis never knew his father, who died when he was an infant. His mother worked in a textile factory. 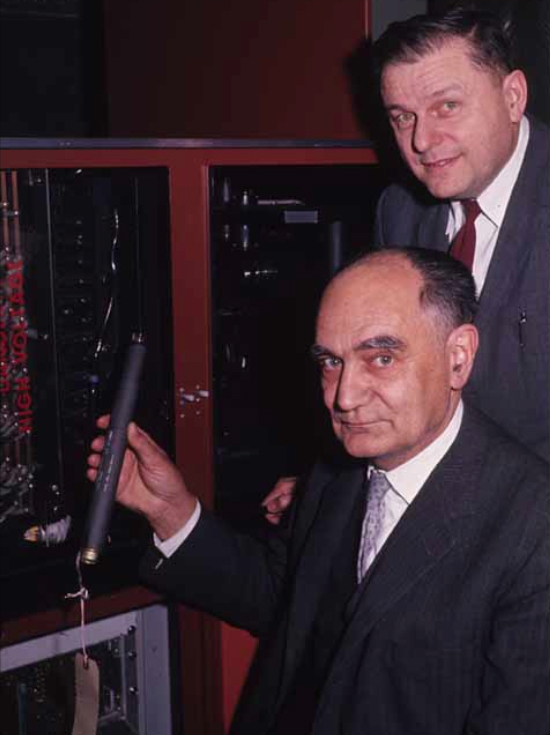 Higonnet and Moyroud with one of their devices at MIT in the 1960s. As a student, Louis was outstanding. He received government support to study engineering at one of the best institutions in France, École Nationale Supérieure d’Arts et Métiers and he graduated in from there in 1936. Upon graduation, he served in the French army as a second lieutenant and was promoted to first lieutenant in 1939. Louis’s work as an inventor began after 1941, when a subsidiary of ITT Corporation in Lyon called LMT Laboratories hired him. International Telephone and Telegraph was by this time a global corporation that owned both telephone services infrastructure and manufacturing operations that produced telephone equipment. In the early 1940s, Louis was working with Rene Alphonse Higonnet when they observed the traditional process of hot metal typesetting in a French printing plant. Based upon some scientific breakthroughs associated with light, optics and photography, Moyroud and Higgonet believed that an alternative to the casting of molten metal typesetting could be developed. As with many breakthrough technologies, there were many people trying to displace hot metal typesetting with a more advanced system. Moyroud and Higonnet were the first to build a functioning solution that was made into a commercial product. Much of the pressure to find a viable photographic typesetting system was being driven by the replacement of the letterpress printing method by offset lithography. Moyroud and Higonnet worked throughout the war years on their project and first demonstrated their invention in September 1946 in Lyon. Their first functioning photocomposing machine used a typewriter, a strobe light and a series of lenses to project characters from a spinning disk onto photographic paper. The typeset copy could then be used to make printing plates. Moyroud and Higonnet called their machine the Lumitype. The machine created in 1946 by Moyroud and Higonnet. They called it Lumitype. With the post-World War II technology revolution underway, Louis and Rene moved to the United States to pursue the commercialization of their concept. They approached Vannevar Bush, president of MIT and President Roosevelt’s top technology adviser, with their prototype. Bush put them in touch with William Garth, President of Lithomat Corporation, a Cambridge, MA manufacturer of presensitized offset duplicator plates. Garth was convinced that a successful phototypesetting system would stimulate the growth and expansion of offset printing and drive sales of his Lithomat plates. He formed the Graphic Arts Research Foundation to raise financial resources for the development and marketing of Moyroud and Higonnet’s invention. Encouraged by the possibility of dramatic cost reductions in the print production process, Garth attracted support from major newspaper publishers, book printers and traditional typesetting services. After several years of development work, significant support for the project came in. 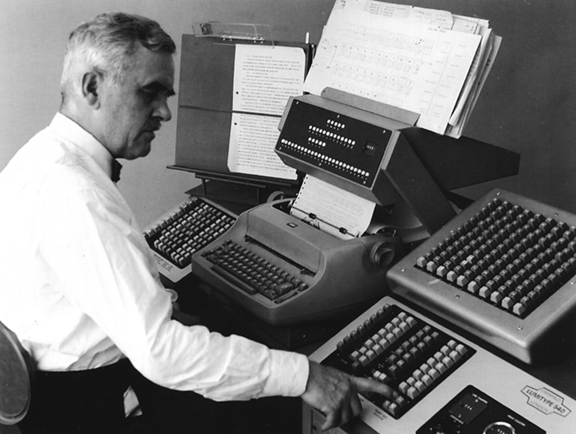 Garth spent over $1 million to create a prototype phototypesetter. He also changed the name of his firm to Photon, Inc. The prototype device was called Petunia and it was used to set the type of the “Wonderful World of Insects” in 1953. In 1957, Moyroud and Higonnet were granted a patent for their invention and tens of thousands of phototypesetting machines were sold. For more than 30 years, this method of producing type was dominant for printing, publishing and advertising copy. Mechanical artwork was produced by “paste up” artists around the world for reproduction on offset lithographic printing presses. Hot metal type and letterpress printing rapidly receded into the background, although some Linotype-generation systems remained in use for specialty work and that continues today. In 1985 (two years after the death of Higonnet), Louis Moyroud and Rene Higonnet were inducted into the National Inventors Hall of Fame in Alexandria, Va. Ironically, 1985 is also the year of the advent of desktop publishing, a technology that would— within a few years—completely displace phototypesetting as a method of producing type for print. This fact shows that phototypesetting was a transitory development along the path of the digital transformation of the graphic arts. Louis Moyroud continued his work on phototypesetting systems into the 1980s and his career as an inventor extended beyond the displacement of his most important contribution. He retired to Delray Beach, Florida where he later died in June 2010 at the age of 96. Frank Romano, who worked with Moyroud as the advertising manager of Photon in 1969, wrote the following tribute to Louis, “He had a wonderful sense of humor and an unassuming demeanor. He had collected most of the early phototypesetters and donated them to the Museum of Printing in North Andover. Petunia is on display.